Has one of your customers ever had a bad experience with your business? If you answered no to this question, you are in an elite, tiny group of businesses. The fact is that you can’t please everyone and you can’t please them all of the time. Whether it is due to circumstances that are out of your control, or a rogue, inexperienced employee, the day will come when your brand will create a bad customer experience. Since a bad customer experience is inevitable for your brand, how you handle the bad experience it crucial. In fact, over 80% of consumers say that they have stopped doing business with a company following a bad customer experience. In the study conducted by Ovum, it was revealed that customer service response times made a difference when things went sideways with a brand and those surveyed stated that when a brand’s customer service agent responded more quickly to a problem, it would improve service in their opinion. 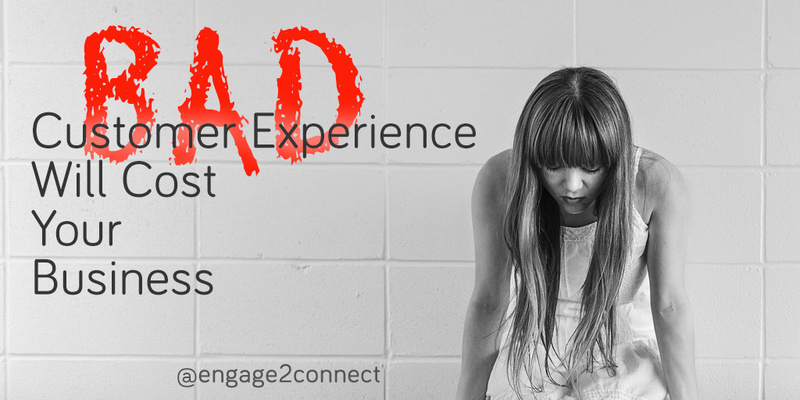 The impact of one bad customer experience is usually amplified through digital channels. Back in the day, a horribly dissatisfied customer told 10 people about the experience and it often involved lengthy and detailed conversations. Those intimate conversations typically had a small impact on the business in question, unless similar unresolved issues continued to occur to many other customers. Today, things aren’t so simple. One customer might share a brief but heated dissatisfaction with your brand and post about it on a social media channel, or worse on several social media platforms. If they have a couple thousand connections on each of those channels, or God forbid someone like us with upwards of 100,000 friends and followers across the social graph, the problem and negative brand exposure increase dramatically. Furthermore, when people start commenting and sharing the negative experience, you have a serious issue on your hands. When customer service issues are ignored or handled poorly, it can gain a viral traction online and also become topics that blogs are written about. The damage from poor customer service, slow response times and not paying attention to your digital channels can escalate to become an extremely costly situation for your brand. This includes lost customers, loss of sales and revenue and a badly impacted reputation that can extend years after the event occurred. In a crisis with a customer, timing is everything. Responding quickly can have a substantial impact on how inflated a customer’s issue becomes. In fact, 60% of those surveyed in the Ovum study stated that easier access to customer support channels on the internet, such as live chat or social media, was among their top two desired improvements to a brand’s customer service. This is further supported by 21% pointing to a desire for faster response times from live support representatives, and 29% who desired a more consistent customer service experience across different channels. Another 19% stated that they wanted to see improved mobile customer service access that addressed how they use technology during a poor customer experience. Across the board, consumers seem to be saying that they want customer service that responds quickly and offers better omnichannel customer service options. 83% of those consumers surveyed stated that they primarily used mobile apps for customer service issues, which is up sharply from 64% just two years ago. Additionally, the usage of live chat on a mobile site during a customer service incident was also up 11% over the same 2 year period. Regardless of whether your company is a small retail business or B2B brand, customers want to be heard and have their problems resolved satisfactorily and expediently. Studies do not make any distinction between retailer customer service or B2B client expectations. So before you think that your brand isn’t in an industry that needs to be concerned about a bad customer experience, we caution you to think again. An angry customer that is being ignored, not dealt with rapidly or made to feel they or their issue isn’t important to you, will most definitely come back to haunt you. If you are going to spend the incredible amount of time, money and resources on marketing today, you really need to plan to retain customers well also. It is much more difficult and costly to get a new customer than it is to keep one that you already have coming back. The impact on time, resources and reputation when you do not properly handle a bad customer experience can be extreme, yet it is totally unnecessary. Finally, be sure that your brand knows how your audience engages in a customer service event and ensure that you are monitoring those channels, have teams that are qualified to handle them when they occur and establish a clear policy on dealing with customer issues.